At the young and impressionable age of 16, Lance Knox donned the Canadian Armed Forces uniform and the artillery cap badge. At the time, the thought of joining the non-commissioned ranks, getting paid, and going on an “adventure”, as the job was then described, piqued his interest enough for him to enlist. Now 39 years later, that then young and naïve teenager is now Lieutenant-colonel (LCol) of the 49th Sault Ste. Marie Field Regiment, Royal Canadian Artillery, and has seen the realities of total war. Knox is the only member in the history of the regiment to go through the ranks from private in 1976 to commanding officer (CO) as Lieutenant-colonel, a title he earned in mid-October at a special change of command ceremony, in which, for the first time, one Afghanistan veteran (LCol Eric Groulx) handed over command to another Afghanistan veteran. Yet despite the prestigious title, Knox’s lengthy career with the Canadian Armed Forces has been served on a part-time basis as a reserve soldier. Prior to becoming the head of the Sault Ste. Marie’s artillery forces, Knox served overseas for eight months in Kandahar Province in Afghanistan from April to December of 2010. 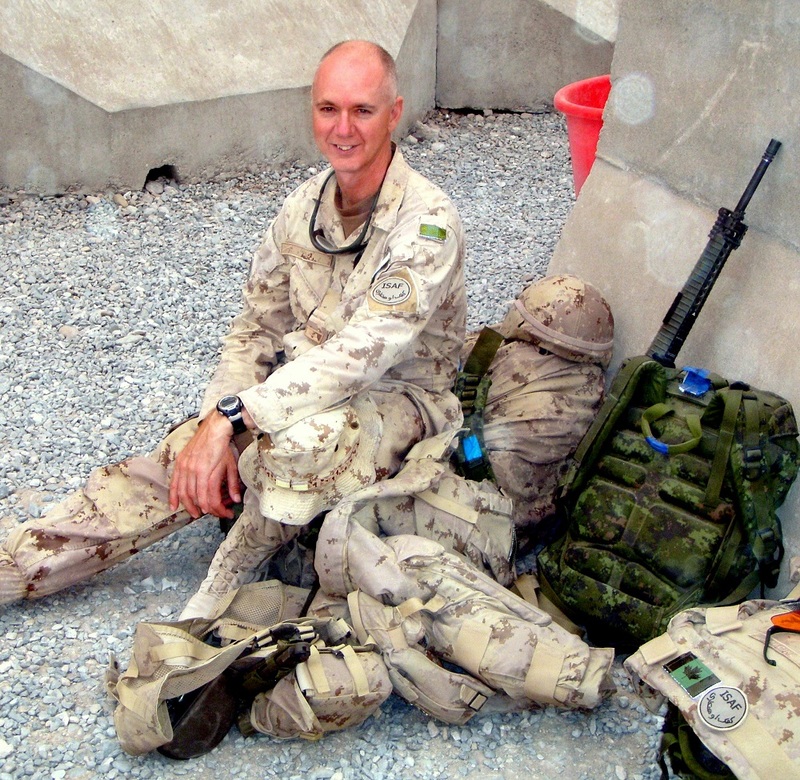 Although Knox did not take up the call to arms initially when Canadians became involved in Afghanistan in 2001, he knew he would venture overseas, and was inspired to do so when members of the 49th Sault Ste. Marie Field Regiment began to voluntarily enlist. As a proud Canadian, and a member of a peacekeeping mission, Knox also wanted to share Canadian values and privileges such as freedom, education, and democracy, with those in Afghanistan. While on active duty, Knox served as Captain and Second-in-Command of the Civil-Military Co-Operation (CIMIC) team. CIMIC operators were responsible for providing support to combat forces in villages and communicating with Afghans. Often, by communicating with the nationals, CIMIC operators were able to understand the needs of specific villages as well as their infrastructure. They were also able to connect relief agencies with one another to provide valuable provisions, such as blankets, to villages that were cut off from supply lines. If a CO was planning to do an operation that could potentially affect a village, CIMIC teams would be able to provide an assessment and comment on the potential impact of that operation on villages, and suggest alternative plans to avoid any distress to villages. While Knox had opportunities to leave the safety of Camp Nathan Smith and Kandahar Air Field, where he spent the majority of his tour, he only left the compound three or four times throughout his deployment. And that was enough, as imminent dangers loomed just metres outside fenced in Forward Operating Bases (FOB). On one of his adventures outside of the confines of Kandahar Air Field, Knox had the opportunity to communicate with an Afghan Elder. The conversation has stuck with Knox, and helped him realize the positivity that has come from his and other Canadians’ involvement in the third world country. “I came across a village Elder who said to me, ‘Education is the way ahead for our life… My grandchildren will learn to read and will be able to help me understand the world better.’ That was pretty insightful for me.” The Elder admitted to not being able to read, including the Quran, and wasn’t able to decipher which way to properly hold a book. Lieutenant-colonel Lance Knox, awaiting helicopter while in Afghanistan. 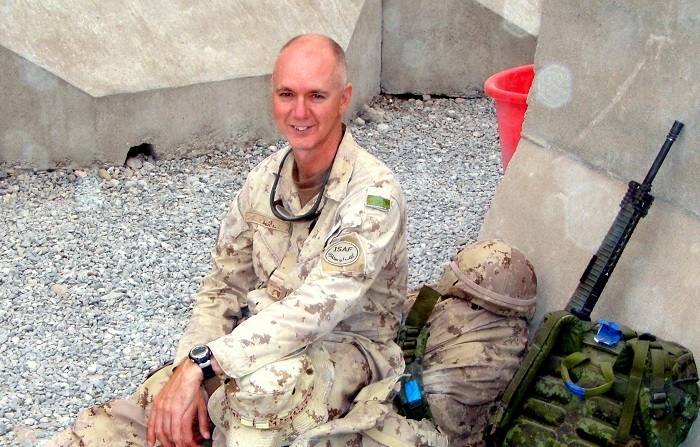 For Knox, Canada’s involvement and mission in Afghanistan brought sweeping change to the country and great pride in himself and in his fellow comrades. Knox admits his tour, including both the positive and negative experiences, has stuck with him. Despite spending the majority of his eight-month tour within a FOB, Knox was confronted by death and the cost of total war on a daily basis. Unfortunately, Knox lost many Canadian, and a few American comrades while overseas. He participated in countless ramp ceremonies, in which a casket containing a fallen soldier was loaded into an airplane to be transported back to loved ones in Canada. In total, 158 members of the Canadian Armed Forces were killed in the line of duty in Afghanistan from 2001 until 2011, when Canada ended its mission abroad. Although he admits one can never be fully prepared to deal with the reality of death and losing a fellow comrade, Knox did have sympathy training prior to his deployment. Knox served as the Casualty Assistance Coordinator in Sault Ste. Marie for Master Corporal Scott Vernelli, who was killed in Afghanistan on 20 March 2009, when an IED detonated near him. Knox provided vital support for the immediate family of Vernelli. If the opportunity presented itself to Knox, he doesn’t feel he would participate in another tour of duty – but not because he wouldn’t want to. He admits that being 56 years-old and close to retirement has put a damper on those sentiments. Between his eight months in Afghanistan and his eight months of work-up training leading up to deployment, Knox had to push back his retirement with the Ministry of Transportation, where he works on a full-time basis. He also isn’t sure he could put that kind of pressure and stress on his family, which consists of his wife Pattie, and children, Jacob (who is also a member of the 49th Sault Ste. Marie Field Regiment) and Jennifer. His family has been supportive of his entire military career, including his time overseas. Last year, Knox served as the Guest Speaker for the 2014 Remembrance Day Ceremony at the Essar Centre. Remembrance Day has always been a day of utmost importance for Knox and he started participating in the City of Sault Ste. Marie’s annual ceremony when he was a cadet. But his concept of Remembrance Day changed after returning home from Afghanistan. To show your support for Remembrance Day and Canada’s men and women in uniform, Knox urges citizens to proudly wear a poppy this Remembrance Day.